Make our Cottage your *vacation home base* for all your activities in Leelanau County and the Grand Traverse region. Play by day, and relax by night in the spacious back yard with a bonfire. The cottage is perfect for those with younger children and/or a pet, with a fenced yard and full hardwood floors throughout the home. The home sits across from a park & tennis courts. Within walking distance to restaurants ,wine tasting, distillery and Lake Leelanau boat launch. Just minutes away from Sleeping Bear Dunes National Park, Glen Arbor, Leland & Fish Town, Suttons Bay and Northport. You are in the perfect location to enjoy all the areas attractions. Come join us this summer for the National Cherry festival, Cedar Polish festival or a multitude of area events. Book early for Fall Color Tours, Harvest Stampede. Please be aware that during prime summer months we do only weekly bookings from Sunday to Sunday’s. My job requires me to travel the world every month, & we have the option to live where ever we want. I see some great places, but none compare to where we have chosen to call home, Leelanau County. My wife & I grew up here, moved back to the area 17 years ago & are raising our family here. We spend our free time enjoying the activities the area offers, boating, the beaches, the Cherry Festival, hiking the dunes, & sampling local crafted beers - wines & spirits. In the winter we enjoy downhill & xc skiing, sledding & snowmobiling. 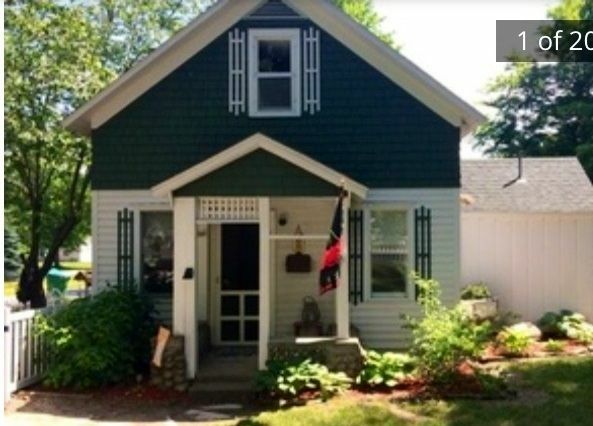 Our cottage is located a stones throw away from all the attractions in the area, so if you want to experience Leelanau like the locals, we are the people, & this is the cottage to stay in. Come experience our Leelanau !. Home is located in the Village of Lake Leelanau. Added Spring of 2017 !! Great cottage in a good spot, it’s clean and well stocked. The yard is awesome and fenced in, our dogs loved running around. The main bedroom bed was a little uncomfortable but other than that we had a great stay! Great location! Will definitely return! We had a great weekend at the cottage! The fenced in yard made it perfect for our dogs. The location is great...close to Leland’s FishTown, Traverse City and Sutton’s Bay. We did not use the upstairs, but it looked very roomy! Great place for a family to stay. Very clean and met our needs especially our dog! Nice owner! We loved our stay at the cottage in Lake Leelenau. A great location, near all our favorite attractions. Being pet friendly we took our dog Abby with us, the fenced in yard was a real bonus, our dog wanted to stay outside most of the day. The nearby grocery store was a convenient plus. If all goes right we will be back again next year. We are glad you enjoyed your stay at the cottage, would love to have you all back again!. Perfect Location! Quaint little cottage. The reviews are accurate—the location of this rental is absolutely ideal for the cost. Sure you could pay more and be ON the water, but Glen Arbor, Sutton’s Bay, Leland and countless beaches, trails and sites are 30min or less away. There’s a cute little grocery store in Lake Leelanau and St Mary’s school nearby has a great dock for kids fishing on the river between north and south lake Leelanau. The home itself is cozy, well supplied and sufficient for most. The master bedroom mattress is terrible. This is the one major knock against the rental. A dishwasher would be great if you plan on eating many meals, but that’s a more difficult addition. No gas grill either. Charcoal only. There’s a cute little park across the street that has the old metal stuff we all used as kids. The neighbors are very friendly despite constant rental turnover. Overall, a great place. Paella at Black Star Farms on Wednesday’s was yummy. I’d advise skipping Traverse all together and explore the other little towns nearby. Sutton’s Bay is my new favorite. You cannot go wrong here. Enjoy! I am sorry that the master bedroom mattress wasn’t to your liking. As a matter of fact, you are the first guest to be unhappy with the mattress. We regularly get compliments on the beds in the cottage.